From left, Acting Coordinating Officer, Africa Circle Pollution Management Limited (ACPML), Mr Ahmadu Fidi Ahmadu; representative of the General Manager, Health Safety & Environment (HSE), Nigerian Ports Authority (NPA), Yunusa Ibrahim; General Manager, Security, NPA, Mr Nasir Anas Mohammed, and the District Manager, Lagos Port, ACPML, Mrs Latifat Ibrahim, at the unveiling of 16 modern trucks procured by ACPML in Lagos, recently. In a bid to fulfill its mandate as contained in the agreement it signed with the Federal Government, the management of African Circle Pollution Management Limited (ACPML) has unveiled 16 new modern trucks. The trucks which are fitted with the latest technology features were manufactured overseas by one the motor vehicle manufacturing giants, Mercedes Benz. The trucks in addition to the earlier ones procured by the company are expected to enhance the operations of the company in the nation’s seaports situated in Lagos, Calabar, Port Harcourt, Warri and Onne. The procurement of the trucks was in line with the requirements of Maritime Pollution (MARPOL) 73/78, one of the key guidelines of the global maritime watchdog, the International Maritime Organisation (IMO) which has its headquarters in London, United Kingdom. With the provisions of MARPOL 73/78, the management of the Nigerian Ports Authority (NPA) is mandated by IMO to provide adequate waste reception facilities for waste generated in vessels calling in Nigerian ports. Unveiling the trucks in Tin Can Island Port Complex, Apapa, Lagos, the Managing Director of NPA, Ms. Hadiza Bala Usman commended the management of African Circle Pollution Management Limited (ACPML) for the strides it has made since it signed the Build, Operate and Transfer (BOT) agreement with the Federal Government. 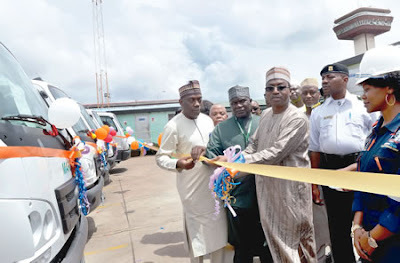 Usman who was represented at the occasion by NPA General Manager, Security, Mr. Nasir Anas Mohammed stated that the additional modern trucks the company has procured would go a long way in enhancing its operations in the months ahead. The NPA helmsman who took time to test drive one of the trucks said the move would help Nigeria to meet the requirements of the IMO as regards the evacuation of waste generated by ships in Nigeria territorial waters. The Acting Co-ordinating Officer, ACPML, Mr. Ahmadu Fidi Ahmadu in his remarks said the firm procured the trucks in order meet the increase in the demands for its services over the years. He disclosed that while eight of the trucks would be used in the ports situated in Nigeria commercial nerve centre, Lagos, the other eight would be utilise in Onne Port Complex, Onne, Rivers State.